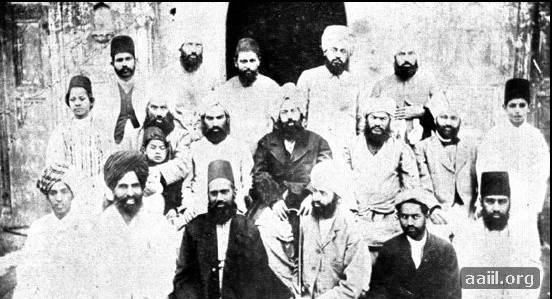 Today is a feast day in the Ahmadiyya Muslim Community or the Ahmadiyya Muslim Jama’at ( احمدیہ مسلم جماعت‎) an Islamic revival or messianic movement founded in Punjab, British India, on this date in 1889. 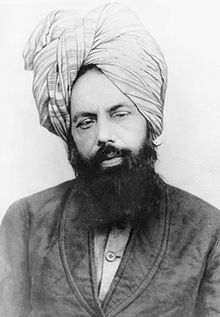 It originated with the life and teachings of Mirza Ghulam Ahmad (1835–1908), who claimed to have been divinely appointed as both the promised Mahdi (Guided One) and Messiah expected by Muslims to appear towards the end times and bring about, by peaceful means, the final triumph of Islam, as well as to embody, in this capacity, the expected eschatological figure of other major religious traditions. Adherents of the Ahmadiyya—a term adopted expressly in reference to Muhammad’s alternative name Aḥmad—are known as Ahmadi Muslims or simply Ahmadis. Ahmadi thought emphasizes the belief that Islam is the final dispensation for humanity as revealed to Muhammad and the necessity of restoring it to its true intent and pristine form, which had been lost through the centuries. Its adherents consider Ahmad to have appeared as the Mahdi—bearing the qualities of Jesus in accordance with their reading of scriptural prophecies—to revitalize Islam and set in motion its moral system that would bring about lasting peace. They believe that upon divine guidance he purged Islam of foreign accretions in belief and practice by championing what is, in their view, Islam’s original precepts as practiced by Muhammad and the early Muslim community. Ahmadis thus view themselves as leading the propagation and renaissance of Islam. Mirza Ghulam Ahmad established the movement on 23rd March 1889 by formally accepting allegiance from his supporters. Since his death, the Community has been led by a number of Caliphs and has spread to 210 countries and territories of the world, with concentrations in South Asia, West Africa, East Africa, and Indonesia. The Ahmadis have a strong missionary tradition and formed the first Muslim missionary organization to arrive in Britain and other Western countries. Currently, the Community is led by its Caliph, Mirza Masroor Ahmad, and is estimated to number between 10 and 20 million worldwide. The Community is now entirely contained in a single, highly organized and united movement, but in the early history of the Community, a number of Ahmadis broke away over the nature of Ahmad’s prophetic status and succession and formed the Lahore Ahmadiyya Movement for the Propagation of Islam, which today represents a small fraction of all Ahmadis. 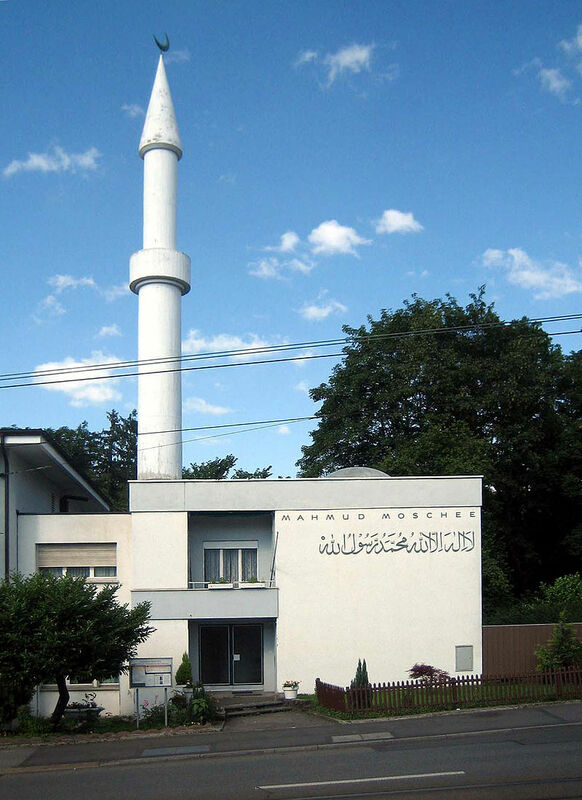 Some Ahmadiyya-specific beliefs have been thought of as opposed to current conceptions of Islamic orthodoxy since the movement’s birth, and some Ahmadis have subsequently faced persecution. Many Muslims consider Ahmadi Muslims as either kafirs or heretics. I’ll leave you to explore Ahmadiyya on you own, if you are interested. At the very least, if you are unaware of the history of Islam, this post should help you see that the religion is divided into sects (much like Christianity, Judaism, or Buddhism), so that trying to understand Muslims as a whole is a serious mistake. Meanwhile, let’s talk about Punjabi cuisine. Outside India, Punjabi cooking may be best known for the tandoor, a clay oven sunk in the ground and fired to high temperatures. Generic Indian restaurants in the West make breads baked in the tandoor, such as naan, tandoori roti, kulcha, or lachha paratha, and tandoori chicken is an enduring favorite. 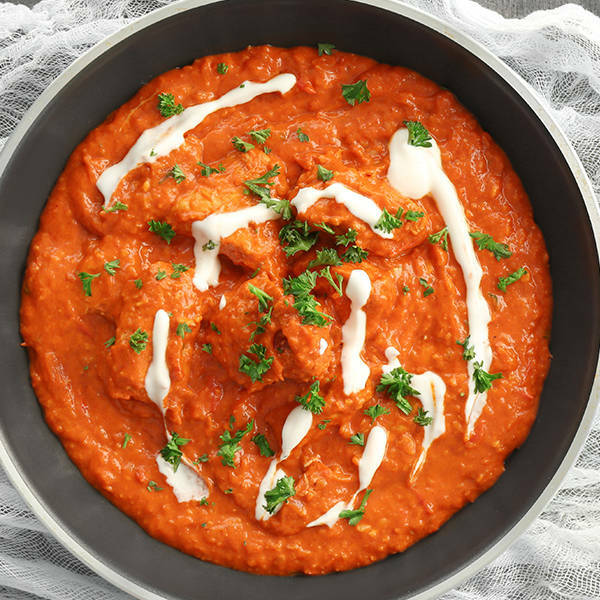 However, the Punjab is also noted for its buttery dishes and butter chicken is probably the best known. You may find it hard to get some of the ingredients, but they can mostly be found online if you do not have an Indian grocery nearby. The amount of butter is cook’s choice. My amounts are just guidelines. The chicken is normally cut into serving pieces with bone in. Put the chicken in a bowl with the ingredients for the first marinade and mix well. Refrigerate for at least 30 minutes. Meanwhile grind together the ingredients for the second marinade. Add this to the chicken, mix well again and refrigerate for an hour. Preheat the oven to the hottest temperature you can. Spread the marinated chicken on a roasting pan and roast for about 30 minutes, or until it is about three-quarters cooked. Meanwhile, make the gravy. Heat 2 tsp of oil in a pan with 2 ounces of butter. Add the cloves, cinnamon stick, mace and cardamom. Sauté until the spices emit their fragrance and then add the chopped tomatoes, garlic and ginger. Mix well and cooked for 15 minutes. Then grind the mix to a paste in a food processor or blender. In another pan, heat another 2 ounces of butter, along with ginger-garlic paste. Add the tomato puree made from the mixture. Now add red chilli powder, kasuri methi, honey and the roasted chicken pieces. Bring to a simmer and cook for several minutes. Add the green chile, cardamom powder and cream. Mix well and simmer for an extra few minutes. Serve in a bowl with a little extra cream drizzled in. Serve with basmati rice and flat bread.